4 Bedroom Detached House For Sale in St. Austell for £650,000. 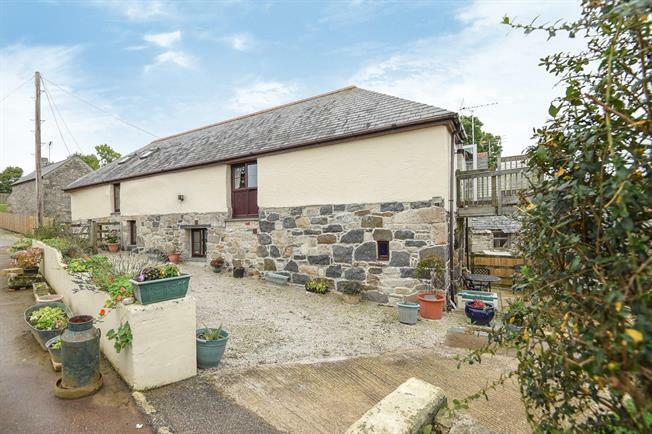 Nobbys and Foxys Cottage are a delightful pair of semi detached, two bedroom, reverse level cottages located within the impressive Court Farm development located on the rural outskirts of St Stephens near St Austell. The properties are almost mirror images of themselves but offering a generous amount of scope to be combined to form one large farmhouse if required. Our clients currently live in Nobbys Cottage whilst letting out Foxys Cottage on a shorthold tenancy basis. These wonderful properties offer potential to any buyer wishing to replicate the existing set up or perhaps those buyers wishing to find a self contained property close at hand for dependent relatives or family members. As mentioned above the properties could be combined to form a large 4 bedroom reverse level family home, subject to any necessary permissions required. The accommodation in brief, in both cottages, comprises of a open plan first floor reception space with separate dining area and open kitchen. The kitchen area in both cottages are again impressive sizes and offer all the modern appliances one would expect of a home of this value. On the ground floors respectively are two double bedrooms and a family bathroom. There is some outside garden space with Nobbys Cottage together with a first floor balcony offering delightful views over the surrounding pasture land and far reaching views of the countryside beyond. In addition to the properties there is a generous farmyard courtyard which provides ample parking for vehicles and farm machinery. There are two detached barns with one of them measuring in excess of 83 ft in length. Our clients currently run a highly successful livery yard business utilising the largest barn and offering up to 15 loose boxes for hire on a monthly basis. Further information on this business if available on request. In addition there is approx. 16 acres of gently sloping pasture land which has been divided for the benefit of the livery business to allow each horse its one private section of ground. There is also a professional size sand school located within the pasture land. The livery clients currently hiring the loose boxes and land are very happy to be reatined as part of the purchase but equally if any purchaser was looking to move their own horses and livestock to the location then the adequate notice will be served to provide vacant possession. The same applies for the tenant currently residing in Foxys Cottage. Court Farm is centrally located in Cornwall in pleasant rolling countryside, about 5 miles to the west of St. Austell and only about 4 miles from a junction onto the A30 (T). The recently regenerated St Austell town centre is situated within easy reach and offers a wide range of shopping, educational and recreational facilities. There is a mainline railway station and leisure centre together with primary and secondary schools and supermarkets. The picturesque port of Charlestown and the award winning Eden Project are within a short drive. The town of Fowey is approximately 7 miles from St Austell and is well known for its restaurants and coastal walks. The nearest village of St Stephen is about a mile to the north-west. The cathedral city of Truro, being the commercial and retail centre of Cornwall, is about 12 miles to the south-west. There is a mainline railway station in both Truro and St Austell linking with London Paddington, and Newquay Airport on the north coast has a number of scheduled domestic and international flights. The following services are available mains electric, private water, mains drainage and telephone line is connected (however we have not verified connection). Two combination boilers, one for each property, provide both the hot water and central heating via radiators on both ground and first floor levels. From Truro, take the A390 towards St Austell. Drive through Tresillian, by-pass Probus and at the roundabout turn right staying on the A390 towards St Austell. Drive through Grampound and continue on to Hewas Water. Turn left opposite Toms Garage, ignore the immediate turning to the right, at the crossroads go straight over and after about a mile take the next turning to the right. Drive down into the valley, ignore the turning to the left, pass Brannel Farm, and at the T junction turn left. Ignore the next turning to the left towards Coombe and the entrance to Court Farm will then be seen after a short distance on the lefthand side.